If you are a marketing expert, then you must know the best way to communicate with your customers. As we know, the customers are the ones who help to grow any business by spreading the word about your works. Therefore, getting their feedback and providing support in real time message would be great. Many business websites have been adding live chat support to their system, which helps to provide real-time answers. If you want to improve your conversion rates on your website, then it is worth considering a best live chat and customer support solution. 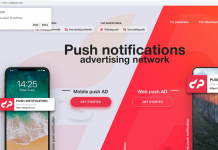 Here we got Crisp, a top rated live chat solution for websites that lets you to see what your visitor type before they hit the send button, automated trigger notification, visitors current Geo location and to monitor their activities on your website. Crisp provides easy and super fun way to chat with your visitors and make the things simple for busy businesses. The Crisp Live Chat platform comes with one of the most attractive designed interface with several color combination where anyone can get started with simple steps. The configuration process is damn too easy, which requires no coding skills. After the launch of Crisp V2.0, the dev team did some outstanding job while keeping in mind the user’s interest. Their main objective is to simplify the communication hurdles between business owners and customers in order to increase user engagement. In short, Crisp making it easier for business and brands by improving user satisfaction and conversion rate. I personally using this tool since last couple of months and based on my user experiences below you read few eye-catching features that impressed me most. How To Get Started With Crisp Live Chat? Crisp Live Chat provides you a great experience to talk with your visitors, engage and turn into customers. It does not matter whether the visitor knows English or not. This live chat solution supports more than 50 locales that include English, Arabic, Chinese, Czech and more. So, even if you are from non-English speaking country then this tool works best for your demands. It is always better to know about the user satisfaction, which helps to improve our business lot than before. Hence, Crisp comes with an unique feature i.e.. MagicType. It helps you to see what your customer typing before they hit send. Yeah, that is one of the coolest features of Crisp live chat and with it, you can understand the real thought of customer about your business and you can respond to their message quickly. If you are worrying about the sudden drop in your sales and conversion, then you must check the Crisp automatic trigger. 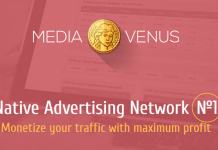 It allows you to boost the conversion rate up to 31%. These triggers also facilitates you to set a message on customer leave intent. In this way, whenever someone try to leave your sales page, home page or any other page then they get automated trigger notification. Apart from these, if you have different color choice or you want this live chat to be set according to your desired color combination, logo and avatar then you can do easy customization. Most of the customer service tools lagging on easy installation on their web pages. 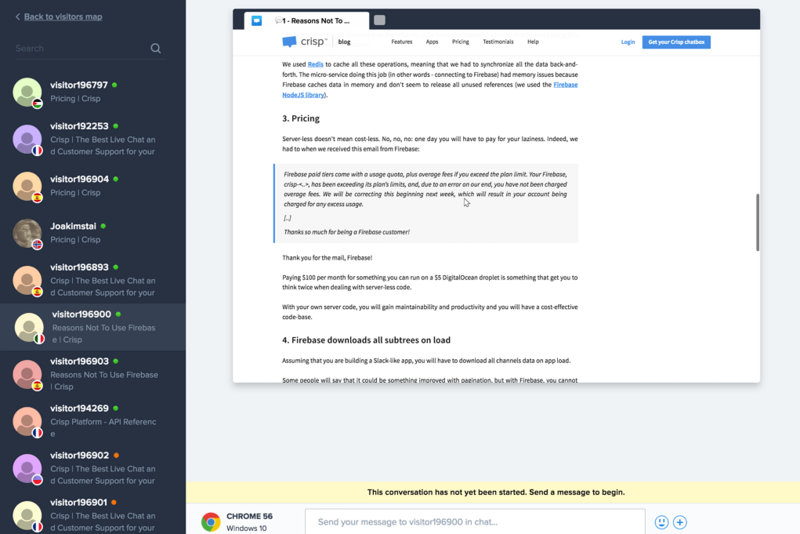 Crisp integration process made simple and it allows you to integrate with other third-party tools like Zendesk, Slack or even Mail and synchronizes your old messages. Connecting with the tools that you love and replying messages from your existing tools keep your existing workflow. 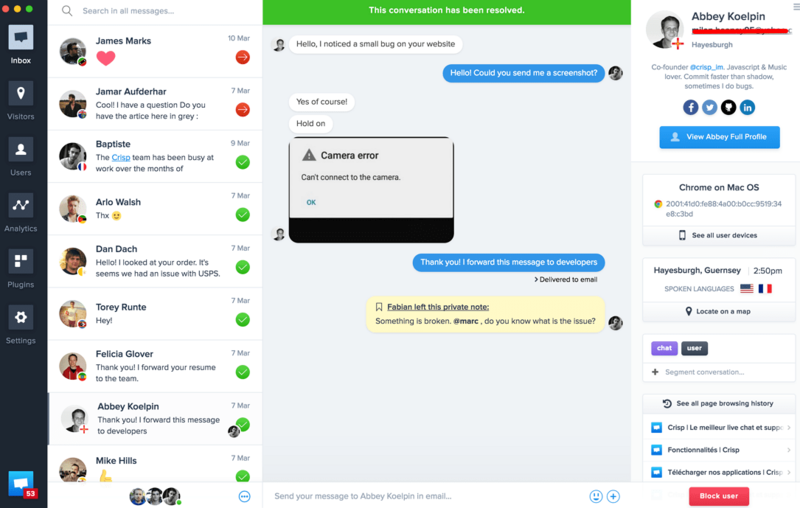 With single-click operation, you can add Crisp live chat to multiple CMS, which includes WordPress, Shopify, Prestashop, Messenger, HTML platform and more. It will hardly take less than 2 minutes for executing this process, which require no technical skills. Just Click, choose the CMS and rest will be taken care by Crisp Integration process automatically. If you want to install manually, then you can follow the step-by-step tutorial video for each CMS tools separately. You can find these guide videos in Crisp dashboard itself. Reaching all your customers from a single interface would be great and Crisp provides you with that. You can reply all your customer queries and gives you a different experience from LiveChats, Message, SMS, Email, and Telegram. When customers get a quick response from a person behind the company, it is more likely that they will have a stronger connection to your business and it leads to sharing their true experiences about your business. If you are getting 50,000 visitors to your website who just do nothing and real active 10,000 visitors who do something is called as audience engagement. Engagement gives context on what people think about your content or your products and your website performance. To build a huge active audience, you can create some campaigns in Crisp live chat and get connected personally with thousands of your visitors. You can send messages to all your customers that help you build an audience also its lead to make your business global. Schedule the messages to be sent to your customer in batch wise for better engagement. Crisp also allow you to target your customer and split the campaigns across various segments and that helps to send the right message to the right person. Users can reply directly to your emails and you will get those messages in your Crisp inbox. Crisp comes with two powerful insight and analytics feature that helps the web admins to monitor the activity of the customers. These features are super amazing and interesting. A few years back, many websites integrated with real time users widget that shows how many users are active on their site. Just like that, MagicMap a new feature from Crisp helps you to get real time Geo-location about your customer, from where they are messaging you. 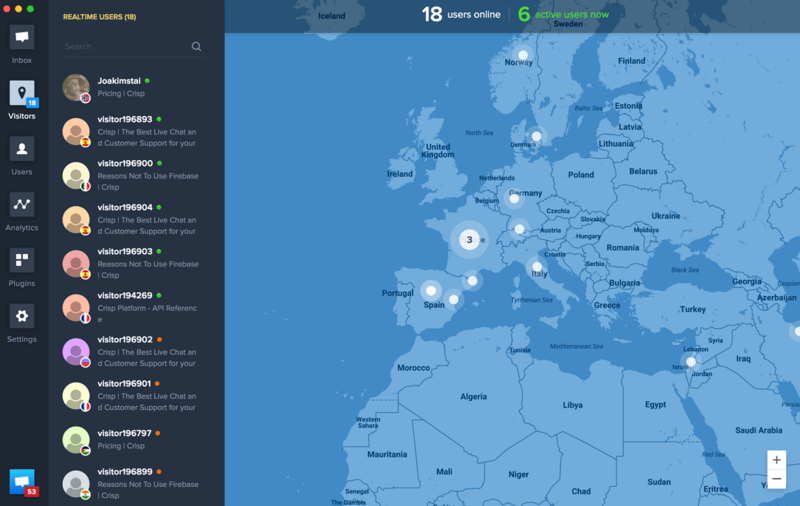 It gives you a real-time world map pointing that tells customer/visitors current location, language they speak and avatar. MagicMap is indeed a great feature to monitor our customers. It is always good to know what your visitors doing on your website, isn’t? Luckily, the Crisp is integrated with a feature called MagicBrowse that helps you to monitor what your visitors doing on your web page in real time. The real time visitors’ screen starts streaming in your dashboard along with the activity they are doing. It will start showing within the certain time limit by allocating a separate name for the visitors. These two features are super exciting and I am sure web admin like such kind of tool to monitor their web pages. Crisp consider all type of marketers out there and wanted to make sure they are a viable and cost effective solution for everyone with affordable price. Crisp have 3 pricing plans with various packages and bonus features. All these 3 plans offered with unlimited conversation and users. 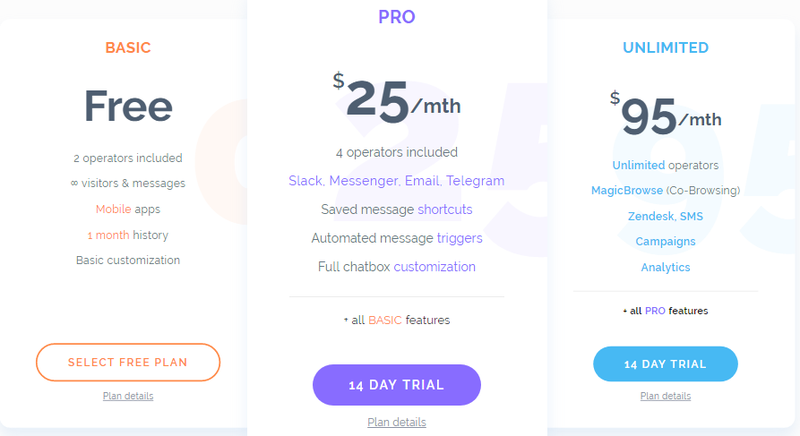 The only thing that differs will be third party tool integration, Chatbox customization, shortcuts etc… If you are looking for better productivity then I recommend Pro [$25] and Unlimited [$95] plans are great to get started with. It always better to try the full feature of Crisp Unlimited by gaining the 14 days trial period before buying the subscription pack. Again, if you do not want to start with paid version then you can join the basic plan. For demonstration purpose, I am going to guide you with step-by-step procedure to get started and show how you can integrate on your website within few min. First, go to the Crisp sign up page. Enter your account details like your website URL and Name then click on Continue. 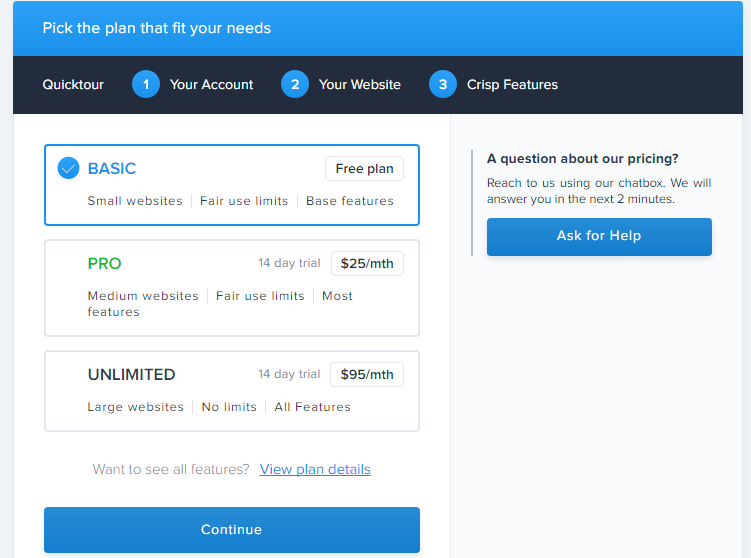 Now you will have to choose your pricing plans according to desired features. If you want to see the complete feature then go ahead with ultimate plan that also comes with 14 days free trial. Once you done with plan selection, it will lead you to the Crisp dashboard. Click on which platform you want to install Crisp Chatbox. Here, I am choosing WordPress CMS (most common). Go to your WordPress dashboard > Add New Plugin > Search “Crisp” and install it. Navigate to the Crisp setting on your WP dashboard, and click “Connect with Crisp”. That’s it! Check your webpage, you will see Pop-up Chatbox on your web page. There is no doubt that Crisp is one of the most attractive designed live chat that comes handy with easy installation. It is one of the unique live chat that provides all one in one solution ranging from third party integration, welcome triggers, leave intent trigger, co-browsing (MagicBrowser), Real time Geo location, Team management and several others. However, you cannot enjoy all the features in free plan, for that you need to subscribe to Pro or Ultimate plans. I really loved the cool looking design and UI, which is customizable and generated a statistical report of your visitors for the future analyzing purpose. So, What do you think about the brand new Crisp Live chat solution? Which feature you liked the best? Let us know in comments below.